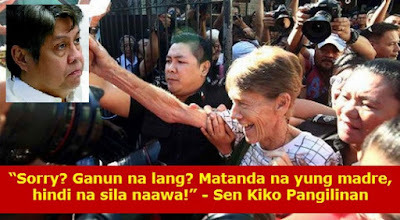 Malacañang Palace apologized on Wednesday, April 18 for the arrest of Sister Patricia Fox, the 71-year old Australian missionary who was arrested by the Bureau of Immigration (BI) last Monday. And although she was released in less than 24 hours, Senator Francis “Kiko” Pangilinan is not happy, and criticized the Palace despite its apology. "Mukhang nagkamali dito kay Sister Fox at siguro apologies are in order, kasi madali naman siyang pinalabas din ng CID (Commission on Immigration and Deportation) ‘no. So siguro nagkakamali din naman ng CID," Presidential Spokesperson Harry Roque said in an interview over GMA 7’s Unang Balita via morning show Unang Hirit. “Meron naman pong batas talaga iyan, na ang mga dayuhan hindi dapat naghihimasok sa pulitika natin, at kahit sino namang gobyerno talagang ayaw nila na manghimasok ang mga dayuhan (There really is a law that forbids foreigners from interfering with local politics, and no government would really want foreign intervention),” he added. Fox, who according to the CBCP (Catholic Bishops' Conference of the Philippines) has worked in the Philippines for 27 years, was arrested on Monday at around 3 pm upon the order of BI Commissioner Jaime Morente, for allegedly participating in political activities and anti-government protest rallies. She was released on Tuesday, at around 2:15 pm. Last Tuesday, Sen. Pangilinan condemned the BI for arresting Sr. Patricia Fox. In a Facebook post, the Liberal Party (LP) president said that he is bothered by her arrest, and accused the Duterte administration of silencing the foreigners who are against the government. On Wednesday afternoon, he made another tirade against President Duterte. “Sorry? Ganun na lang? I thought the president has been firing government officials who are not doing their job well. In that case, I think it’s reasonable enough to also fire Commissioner Morente. Matanda na yung madre, paano siya naging threat sa gobyerno? Hindi na sila naawa!” Pangilinan told reporters in an ambush interview.